A classic steamed Christmas pudding contains suet, which is animal fat. This recipe for Christmas pudding with rum cream excludes the suet and is much lighter as a result. Dried fruit and rum provide the rich flavor. Start this at least one day before serving. Kids can help measure and stir. Occasionally, it’s served flaming with a sprig of holly on top. Old English custom calls for adding little metal charms to the batter of Christmas puddings. If one of these surprises lodges in your bridgework, it is said to indicate what type of fortune is ahead for you in the coming year. Finding a ring means you are to be married. A coin signifies wealth. A button heralds spinsterhood and a thimble bachelorhood. 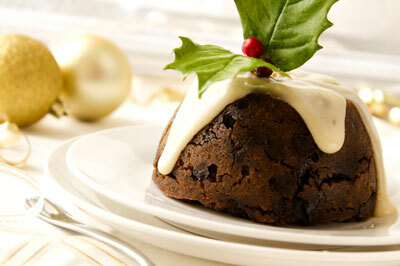 Christmas Pudding is also called plum pudding because plums, specifically dried plums, are often included. Combine all the dried and candied fruit with the spices, rum, orange juice, honey, and vanilla extract in a large bowl. Stir together well, cover with plastic wrap, and let sit at room temperature overnight. The next day, generously grease a 2-quart pudding mold. Stir together the breadcrumbs, flour, baking powder, and salt; set aside. Beat the butter until it’s creamy in a large bowl with a flat paddle using an electric mixer on medium speed. Gradually beat in the sugar until the mixture is light and fluffy. Beat in the eggs one at a time, scraping down the bowl once or twice. Stir the fruit mixture, including any liquid, into the butter and egg mixture. Stir in the dry mixture just until combined. Scrape into a pudding mold, smoothing the top. Attach the lid or, if using a bowl, cover tightly with aluminum foil. Place on a rack set in a large pot. Add enough boiling water to come halfway up the sides of the mold. Cover the pot and simmer gently on the lowest heat that maintains the simmer for about 13/4 hours or until a toothpick inserted in the center of the pudding comes out clean. Remove the pudding from the pot; set on cooling rack for about 5 minutes. Unmold the pudding onto a serving platter and serve immediately with rum cream. Alternatively, let the pudding cool completely, wrap it in plastic wrap, slip it into a large resealable bag, and refrigerate for up to one week. Bring back to room temperature before serving and reheat gently in a microwave on low power or insert back into the mold and re-steam until heated through. Beat the heavy cream and sugar until very soft peaks form. Per serving: Calories 481 (From fat 135); Total fat 15g (Saturated 8g); Cholesterol 111mg; Sodium 295mg; Carbohydrates 85g (Dietary Fiber 5g); Protein 7g.